The Kintyre Cultural Forum (KCF) is pleased to announce that they will be taking part in the inaugural World Book Night (WBN) on Saturday March 5th 2011. 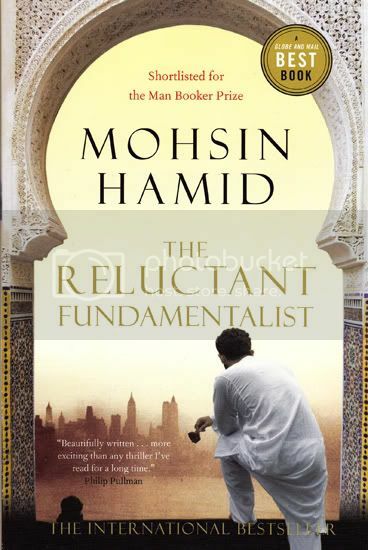 As part of WBN the KCF will be giving away 48 free copies of “The Reluctant Fundamentalist” by Mohsin Hamid in collaboration with Campbeltown Library, The Old Bookshelf and Martins Booksellers. World book Night is a dynamic and unprecedented industry-wide initiative to celebrate adult books and reading which will see one million free books given away on World Book Night by 20,000 passionate readers to other members of the public across the UK and Ireland. World Book Night will take place two days after World Book Day, the established nationwide reading campaign. I will post up more information later in the week. I can now confirm that this event will take place between 2pm and 4pm on Saturday. We have already had quite a bit of interest from local book and writers groups as well as various individuals who would like to come along. 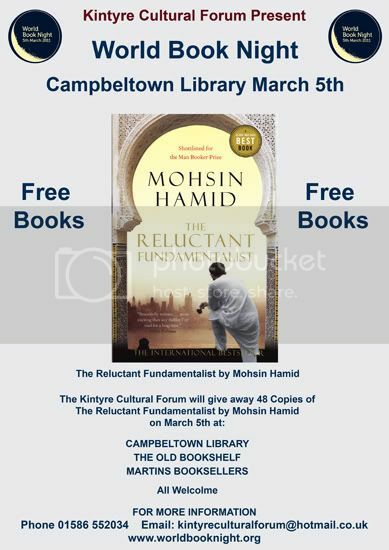 Please feel free to come along for your free copy of The Reluctant Fundamentalist and take part in what will be a huge national event. WBN appointed a panel of experts to chose the 25 books to be given away with 40,000 copies of each being printed specifically for event. The aim is to hand out over 1,000,000 books on March 5th and the organisers have arranged a huge launch in Trafalgar Square on March 4th followed by a series of shows on BBC 2 on March 5th celebrating A Night of Books. The aim of WBN is to help encourage new readers to start reading books so if you receive your free book please pass it on for someone else to read. If all goes well and there is enough interest the Kintyre Cultural Forum will be happy to do an event like this again.